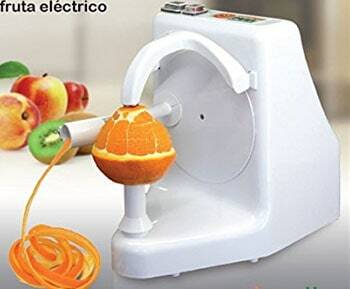 Electric orange peeler machine is great to have when you want to treat yourself with delicious orange but don’t like peeling crust. Nobody likes to peel. At least, nobody I know. It is boring, repetitive tasks. While most people know what a traditional peeler is, electric or automatic orange peeler is not so common in the household. However, the aid they provide in a kitchen is almost priceless. Most of them use spinning axis on which the vegetable or fruit is inserted and a blade that will stay in a fixed position. The blade will scrape the surface of the fruit or vegetable. 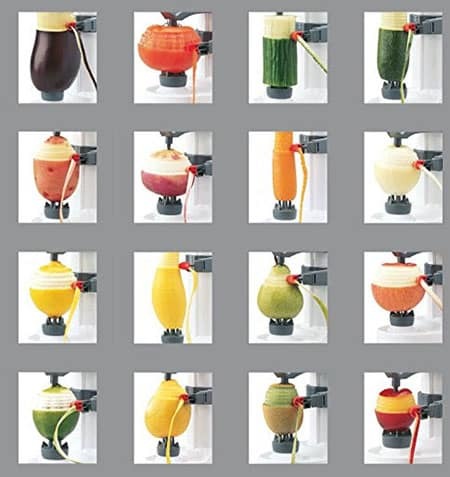 They don’t require any kind of interaction from the user except putting fruit or vegetable that needs to be peeled. They are much faster than traditional peelers and easy to clean. Electric peeler machines save the time and effort that comes with hand peeling and skinning your fruits and vegetables. Peel a large amount of potatoes within a few minutes, peel vegetables and fruit at the press of a button. You put a vegetable or piece of fruit onto the spikes, switch on the peeler and watch as the cutting arm automatically follows the rotating contours quickly removing the skin or peel in one single piece, from top to bottom. And, when it’s finished, the peeler even turns itself off. It's an electric peeler, you can plug it in or use 4 aa batteries. 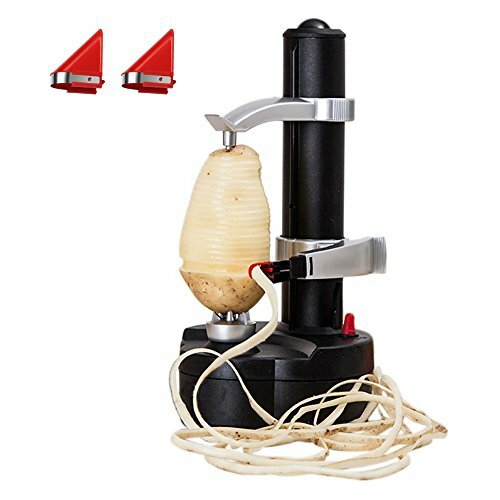 One of the best rated and well-known electric orange peeler is the Starfrit Rotato Express Electric Peeler. It instantly skins potatoes, fruits, and vegetables in a simple one-touch paring action. 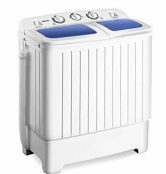 It is made of ABS plastic that makes it durable to withstand everyday use. It makes peeling easier with no mess and less waste than using a traditional hand peeler. It’s easy to use. You press the button and let the Starfrit peeler do the work for you. Two additional blades are provided in a compartment at the bottom of this electric peeler for complete skinning. It is more hygienic and comfortable when compared to manual peeling. 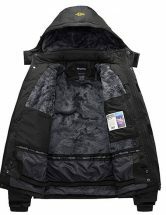 It comes with a non-slip base that stays stable during the peeling process. 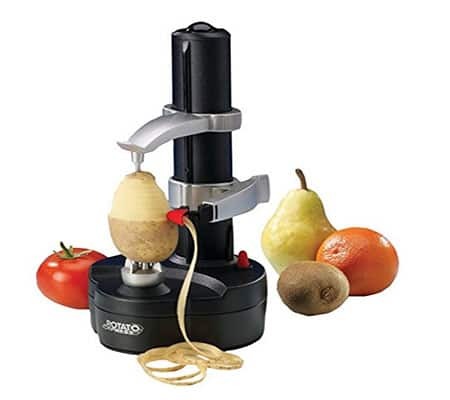 This Starfrit Rotato Express Electric Peeler is perfect for even the most delicate of fruits and vegetables. The Rotato Express instantly peels not just oranges but also other fruits and vegetables. It stops automatically when the peeling is over and will operate cordlessly with batteries which makes it portable. It peels just the skin without wasting any of the nutritious parts of the vegetable. The Rotato Express is simple and safe to operate. Its non-slip base holds it securely to the counter or other work surfaces. Rotato comes with a little plastic knife, stored under the base. Peels the following food: Potatoes, cucumbers, apples, pears, peaches, turnips, onions, tomatoes, radishes, kiwis, oranges, etc. When choosing foods to be peeled, choose fruits and vegetables that are firm, blemish free and symmetrically shaped. Fruits and vegetables more than 5.5″ tall should be cut in half so the Rotato Express can grip them firmly. Center the food on the bottom food holder and press gently. Lower the upper food holder so that it grasps the food and holds it securely. Using the height adjustment lever, raise the cutter arm so that it rests on top of food to be peeled. While pressing lightly on the upper food holder, press on the power button. The skin peels off in one clean, continuous curl. The electric peelers are not that expensive when compared with the manual ones. They are much more convenient but the manual ones are much better at peeling fruits and vegetables by my opinion. You can cut off 1/2 cm on the top and bottom after peeling because it does not peel that area or you can leave it and manually peel that part. 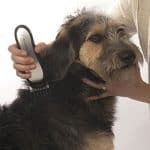 Clean up is very easy and the blade itself is easily removed and can be washed. As long as your food is not starting to get mushy or have holes in it, electric peeler will peel it without issues. The blade may get dull when used for anything more than infrequent personal peeling. Overall, I think automatic peelers are valuable to have in the kitchen but can’t entirely replace manual peelers. The peeler makes a long and dreaded task of peeling quick and easy.